N64 image of Nabooru, Sage of Spirit. Nabooru (nä-bōōˈroo) is one of the seven sages chosen to guard the Sacred Realm of Hyrule. This once lone wolf thief now is the leader of a rogue group of thieves known as the Gerudo. She answers to no one but the King of Evil, Ganondorf, himself. Nabooru's reputation took a turn for the worse after she joined forces with the Gerudo. A certain villager even states that when she was but a lone wolf she only stole from the rich, a sort of Robin Hood. But now that she roles with the Gerudo, this is not the case. Appalled by Ganondorf's latest hoarding of treasure, she implores Young Link to retrieve the Silver Gauntlets for her in order to better search the temple for Ganondorf's treasure. After doing so Link returns to Nabooru, only to soon after find her sucked into a whirlpool of sand by the illustrius Twinrova. Seven years later, (with the help of the Master Sword), Link returns to the Spirit Temple versus an Iron Knuckle which turns out to be an imprisoned Nabooru, bewitched by the very same Twinrova, free's her, and cleans the Spirit Temple of Twinrova's wrath. 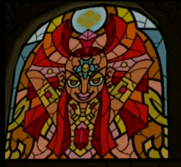 Stained Glass Window of Nabooru, Sage of Spirit. This page was last modified on 4 October 2006, at 12:21.